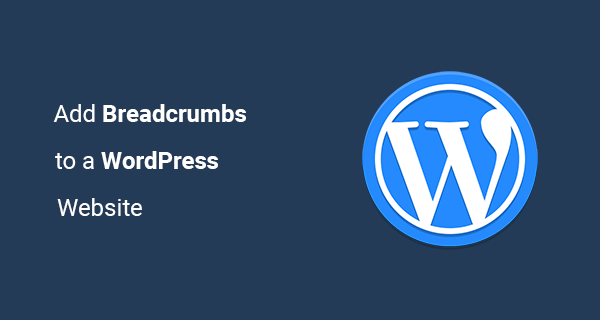 Wondering what is a breadcrumb and how to add breadcrumbs in your WordPress website? Breadcrumbs help users to understand where exactly they are currently browsing on your website. Users can navigate website better with the use of breadcrumbs especially if a website has numerous pages. In this tutorial, I am going to show you how exactly you can add breadcrumbs to a WordPress website. Previously, it was a long process to add breadcrumbs to every HTML page of a website, and that too by a tiring long manual process. But thankfully to WordPress, it is now an easy process. Depending on the fact that how much you want your breadcrumbs to be customized, WordPress offers different ways of adding them to a site. Simply put, breadcrumbs help users navigate and understand website link hierarchy. In other words, the main purpose of breadcrumbs is to provide users a way to easily navigate through your website. It also helps search engines in understanding the hierarchy of the links. Why Breadcrumbs are Important for SEO? Google and other search engines can show these breadcrumbs in rich snippets. However, you may have to add structured data markup for breadcrumbs, so search engines can understand these breadcrumbs links and show them in search snippets. Breadcrumbs point out certain keywords of different web pages and help search engines to see how one page is related to another on a site. When you use them in the hierarchy, it helps you in improving your SEO for the category pages as well as the innermost pages of your website. Breadcrumbs also help in improving the internal linking and website structure. Adding breadcrumbs can help you in reducing your bounce rate. If a visitor does not find what he is looking for in his first session, breadcrumbs can show them an alternative path to other parts of your website. How to Add Breadcrumbs to a WordPress Website? It is quite easy to add breadcrumbs to a WordPress website. However, it is important that your theme should support breadcrumbs navigation. Else you might have to adjust the code to display breadcrumbs on a WordPress website. We will be using 2 different plugins to add breadcrumbs. Note: Before applying technical changes on your site, I would highly recommend you to backup your website. If you are using WordPress, then I am pretty sure you must have heard of this plugin ‘Yoast SEO’. It is one of the best WordPress SEO plugins to improve website’s SEO. You can use it to add breadcrumbs to your website. Here’s how to properly configure breadcrumbs using Yoast SEO. After that, find the Yoast SEO menu in the right sidebar menu and go to SEO > Search Appearance > Breadcrumbs and enable the breadcrumbs. It is a standalone breadcrumb plugin which is widely used due to the fact it is quite easy to customize and there are many options to enhance the style of breadcrumbs. I personally use this plugin on this website. Install Breadcrumb NavXT plugin from WordPress plugins directory. Activate this plugin. Note: Some themes have different theme structure, so you may have to contact your theme developer and ask where to place breadcrumbs. Now you should have breadcrumbs on your WordPress site. To configure this plugin setting, go to settings > Breadcrumb NavXT. I hope you find this post useful. Please let me know your thoughts in the comments below. If you are looking for an SEO expert to help you improve your search ranking, then you can check out my white hat SEO services.